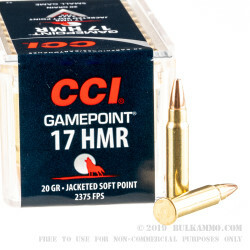 CCI Gamepoint ammunition pushes rimfire cartridges to perform at extraordinary levels. This .17 HMR cartridge propels a light 20-grain jacketed soft point bullet to a muzzle velocity of 2375 feet per second, resulting in a flat trajectory and sub-MOA accuracy at 100 yards. The bullet is engineered for strong penetration and expansion without damaging edible meat, making it ideal for hunting prairie dogs, squirrels, rabbits, raccoons, and other small game. Varmints will never know what hit them! 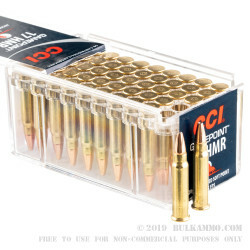 This ammo comes packaged in CCI’s familiar reusable plastic box, which offers superior protection without significant added weight. Cascade Cartridges, Inc, or CCI, is one of the world’s premier rimfire ammunition manufacturers. 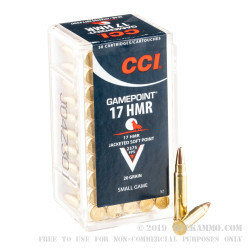 CCI ammo is in constant demand among shooters because it delivers superior reliability and quality at a reasonable price. 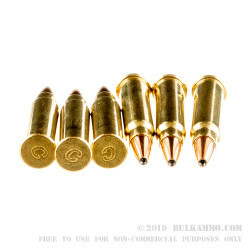 A sister company of renowned bullet maker Speer and a division of Alliant Techsystems, CCI has developed many successful lines of ammo including the famous Mini-Mag, Gamepoint, and Quick-Shock brands. Since its founding in the early 1950s, the company has operated from Lewiston, Idaho. The company manufactures its own primers for use in rimfire ammo, and also produces centerfire primers for Speer and other ammunition manufacturers. CCI is good quality ammo and Bulk Ammo is the place to get ammo.